Brian Horstmann, Engineering Technician, shows a mold to students from Minden High. On Friday, October 6th, Royal welcomed thirteen students from the Minden High School to celebrate October as Manufacturing Month. Students started off their afternoon tour with a video and a speech from Royal’s President Dave Arnold. In his speech, Arnold touched on Royal’s history, composites manufacturing and several aircraft programs that Royal supports. Attending with the students were Minden Schools Superintendent Dr. Melissa Wheelock, High School Principal Don Hosick, Guidance Counselor Jeff Horner, and Bob Carlson and Rick Chramosta, Industrial Technology teachers. The Mayor of Minden, Ted Griess, also toured the facility with students. Governor Pete Ricketts, Director of the Department of Economic Development Courtney Dentlinger, and President of the State Chamber Barry Kennedy were originally scheduled to visit Royal as well on this day but were unable to attend as a result of travel complications caused by the weather. 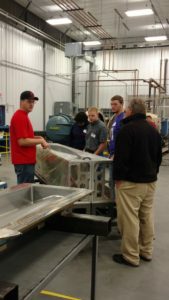 Students were split into small groups and, with the assistance of a Royal employee, toured the plant and talked to employees that work in various areas, including Engineering, CAD, layup and material cutting, CNC, finance and non-destructive inspection (NDI). 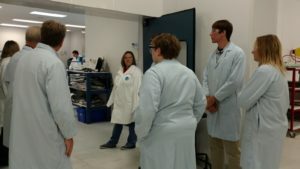 Dani Wendt, Production Support Specialist, with a group of Minden HS students at the entrance to one of Royal’s clean room. Royal’s President Dave Arnold said that the outreach with local high schools is also to help raise awareness for careers that require two-year technical degrees. “There’s a high demand for graduates with technical degrees, and those jobs pay well,” Arnold said. He also indicated that many companies will help an employee pursue a degree. Royal, for instance, will cover up to $2,500 per year towards an individual’s tuition and books. Royal plans to maintain their involvement with the local schools and will continue to advocate for careers in manufacturing.